Steam punk! Rare and unique pendant measuring approximately 1 by 1 1/4 inches. 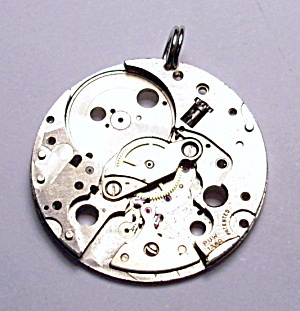 We started making these pieces a few years ago from old vintage watch and pocket watch parts and now discover this kind of jewelry is called Steampunk! The rare beauty of these individual movement pieces are incredible and they can be worn on either side for a completely different look! Click on the picture for additional views. There is no specific date but most pieces are from the late 1800's to the early 1900's. $6.50 Priority Mail or $3.50 First Class Mail shipping and insurance charges within the U.S. Great item for jewelry or pocket watch collectors who like the rare and unusual!